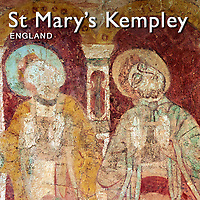 Pictures & images of the rare and most complete Norman Romanesque wall paintings of St Mary’s Church, Kempley, England. The Norman Romanesque church of St Mary’s Lies near the village of Kempsey in the Forest of Dean district of Gloucestershire, England. As well as the oldest surviving timber roof of any building in Britain, dating from 1120-1150, St Mary’s Kempley also houses the most complete sets of Romanesque frescoes in northern Europe dating from 1120. Few Romanesque Norman frescoes survive in England due initially to the demise and ruin of the Monasteries and their churches during the Reformation of Henry VIII, and the later destruction of church iconography by the Puritans under Oliver Cromwell’s command. Between these two catastrophes for British Romanesque art, much was lost when churches were modernised in medieval times into Gothic masterpieces. St Mary’s Kempsey lies close to the border of Herefordshire and was probably built by Baron Hugh de Lacy in the 12th century after the Norman Conquest of England. Baron Hugh de Lacy, (r.1100–35), of Longtown Castle, near Hereford, the trusted counsellor of Henry I. The Welsh wars of Edward I put Kempley in danger of being exposed to reprisal raids from the Welsh. The Church tower was strengthened and the villagers moved further away from the church to higher ground that was easier to defend. The style of the wall paintings in St Mary follow the style of the Eastern Roman Empire, more commonly known as the Byzantines, which was popular in France and the north of Spain. Many knights that returned from the Crusades had seen and marvelled at Byzantine art, and on their return they wanted to adorn their churches with the sumptuous wall paintings that is typical of the Byzantine Eastern Roman Empire. The barrel vaulted chancel of St Mary’s has a complete cycle of Romanesque paintings running up its walls, over the vault and down the other wall. On each side of this vaulted chancel is depicted the Last Supper, with the Apostles lining each wall. Above Christ is depicted in Majesty also known as Christ Pantocrator. This iconic representation is typical of Byzantine icongraphy and shows Christ blessing whilst sitting surrounded by a madorla, and upright eye shaped panel , that makes it look as if Christ is looking down from heaven. A row of six apostles is pained on either side of the chancel. Each apostle is framed by a decorated arch and the lavish decorated clothes they are wearing is again typical of the lavish decoration of the Byzantine style. The overall effect of the Chancel paintings is of a muted fresco cycle that has faded with time but still hints at the lavishness that a Norman Knight expected. The survival of a set of early 12th century wall paintings within a church of about the same date is unusual. Even more extraordinary is the fact that the roof timbers also date from this period.